The effects of ageing are seen around the eyes more than anywhere else in the face. Redundant skin in the eyelids can give them a sad appearance and can even obstruct vision. The bulging of fat in the eyelids can also give them a puffy look. A blepharoplasty removes the excess skin and fat of the eyelids using incisions that are hidden within the natural skin creases. 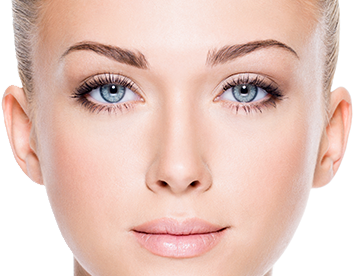 Waverley Plastic Surgery can provide upper and or lower eyelid surgery to give the eyes a more open and refreshed look. Sometimes, in severe cases of upper eyelid skin ageing, a Medicare rebate applies due to visual obstruction symptoms. 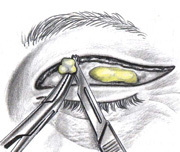 In these cases, some of the costs of the procedure can be claimed back by the patient. The surgery is sometimes combined with procedures to tighten the eyelids or reset the resting level of the upper eyelid to a correct position (ptosis surgery). Another group of patients that seek eyelid surgery are Asian patients, who do not have a fold in their upper eyelid and wish to create one, in order to look more “western” in appearance. These patients are younger and can usually achieve a good long term eyelid correction with “Asian eye Blepharoplasty” surgery. 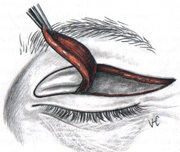 Blepharoplasty can be performed on the upper eyelids, the lower eyelids – or both. 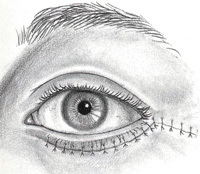 Upper eyelid surgery is less complex and can be performed either as a day procedure in Hospital under anaesthetic or under local anaesthetic in an office setting. 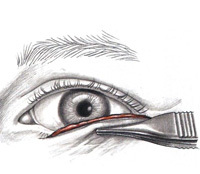 Lower eyelid blepharoplasty is generally performed in Hospital under anaesthetic and is more complex, sometimes requiring additional procedures to tighten the attachments of the eyelid to the eye socket bones. 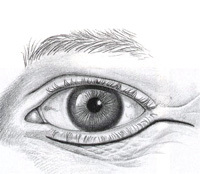 In upper blepharoplasty, the incision line is hidden in the crease of the upper eyelid and may extend out to the side of the eyelid where it is hidden in the wrinkles around the eyes. The excess skin is removed and any excess fat can then be removed. Lower Blepharoplasty scars can be completely hidden on the inside lining of the eye, or sometimes they are made 1 mm below the eyelash line on the skin surface, which creates a very fine scar. Excess fat from the lower eyelid may be removed or redistributed to create a more youthful contour of the lower eyelid region. 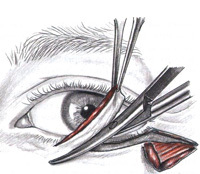 The most common effect of eyelid surgery is swelling and bruising, which persists for around 7-10 days. This can be reduced by the use of cool compresses for 48 hours following the surgery and by sleeping with the head elevated on 2 pillows at night. Some patients who have lower eyelid blepharoplasty can have a red discolouration of the whites of their eyes, which persists for a few weeks. 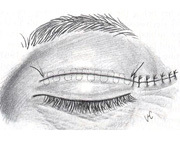 The stitches are removed 4 to 7 days later and makeup may be worn from this time. The goal of surgery is to relieve visual obstruction, recreate a natural, brighter look to the eyes and in doing so, make the patient look younger and happier. If you would like further information or wish to make an appointment to discuss blepharoplasty surgery with Dr David Ying, please contact us at Waverley Plastic Surgery today!